As we have been documenting this elaborate project (or Modern Dream Home) throughout the entire process, from the before photos to the construction and inspiration phases and now to finished products, we are really excited to continue showcasing how each room has turned out. 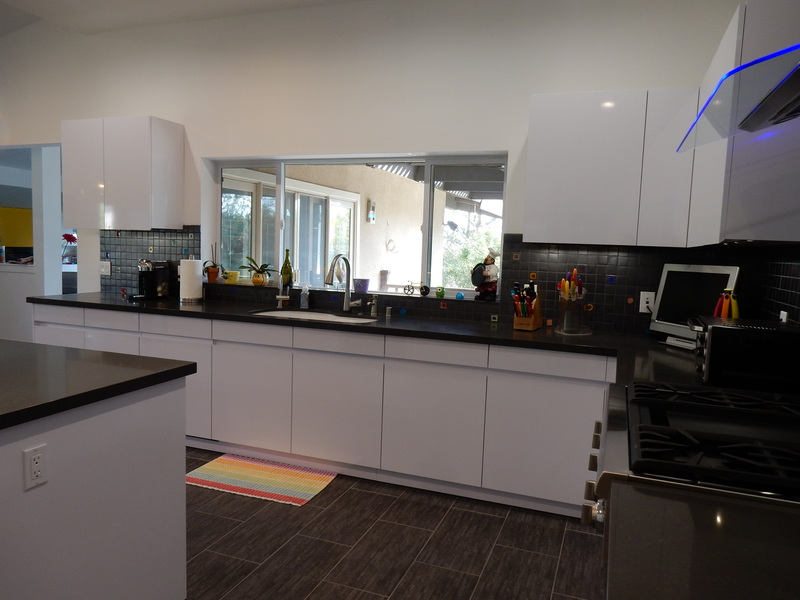 If you haven’t already done so or need a refresher check out our previous post, Under Construction: Modern Dream Kitchen, even if for no other reason than to see how this kitchen looked before. The transformation is incredible! You won’t believe it is the same space! 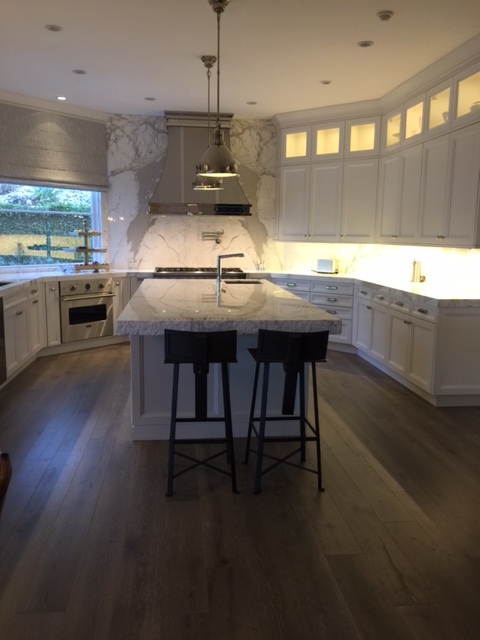 As previously mentioned, (in our post Introducing Leicht) Robyn and Joel went with this gorgeous Leicht cabinetry designed by Kitchen Works LA. They went with an overall white and gray color palette so that all of their colorful accents would pop. 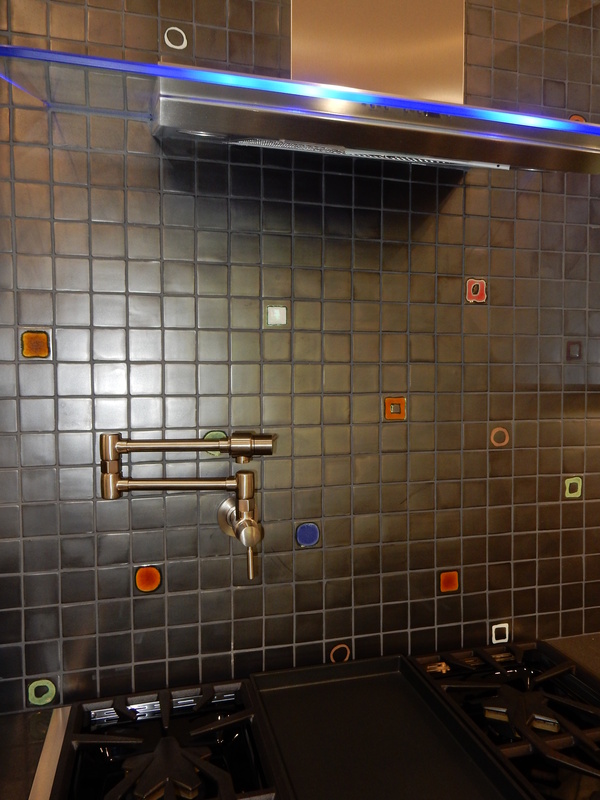 The backsplash tile we selected is a unique one. The background color has almost a metallic finish, the different shapes and color tiles were hand placed in a random pattern. Robyn loves the modern hood they selected for its extra cool blue light feature, and Joel insisted on including a pot filler over the stove top. He does own BJ Discount after all. Raising the ceiling in this room really gave it a large and open feel, and considering it is the central hub of the house (and the place where most people tend to congregate) it now has the look of importance it deserves. The island has some cool features as well. We incorporated a wine fridge on one side and microwave drawers on the other. 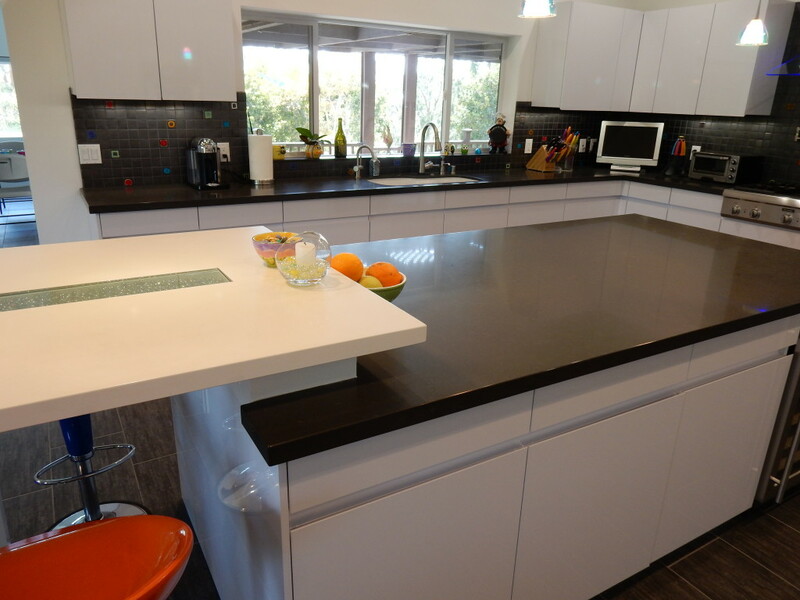 In addition, the top of the island is raised in one area to create an eating space. 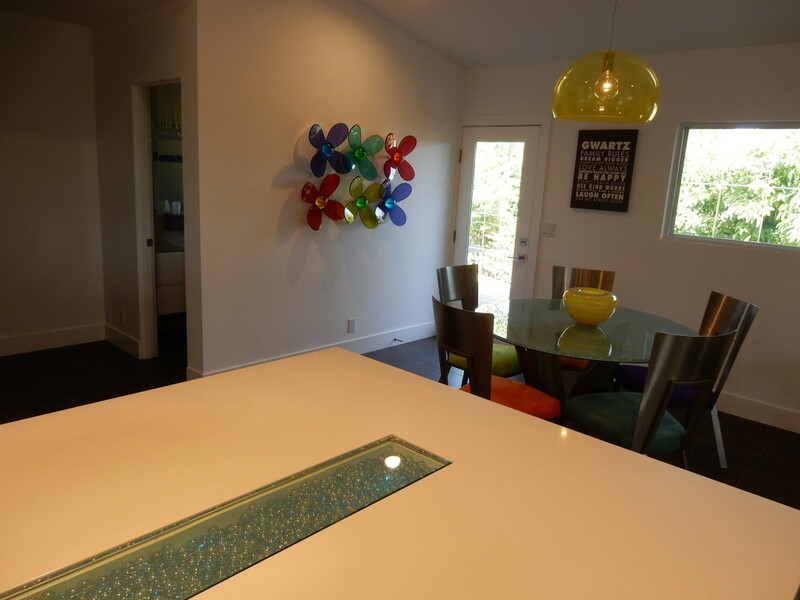 Robyn and Joel designed this cool inset panel filled with marbles that change color through a rotating light feature. 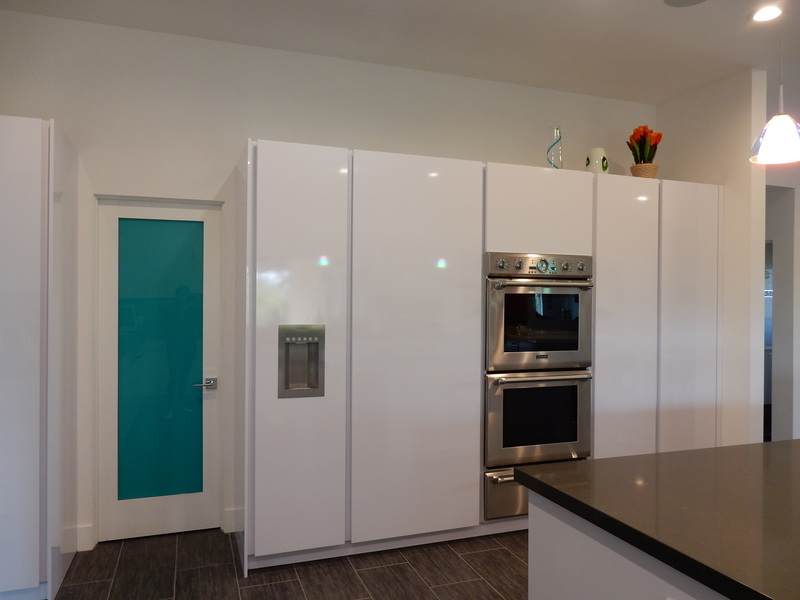 Our favorite detail in this space is the turquoise frosted glass panel we selected for the pantry door. We just love how it looks against an all white wall. 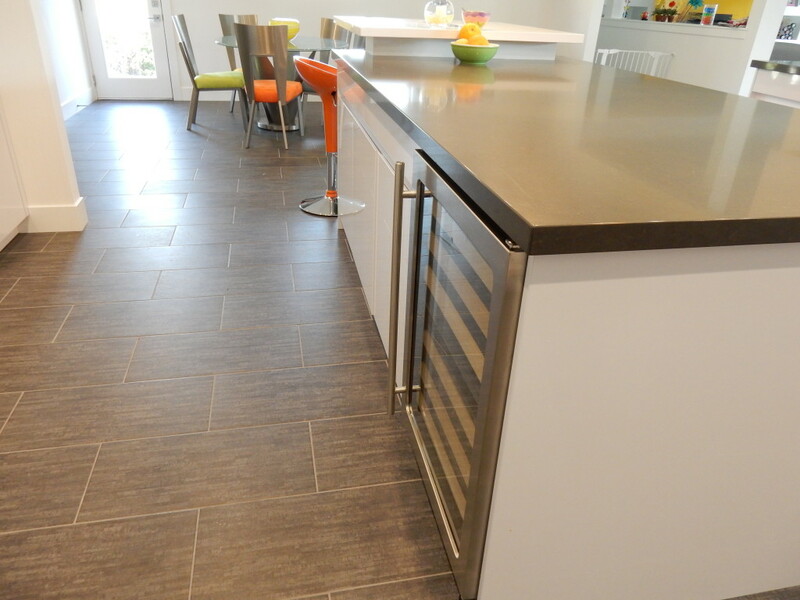 We also love that Kitchen Works LA incorporated integrated panels on some of the appliances but left some showing. 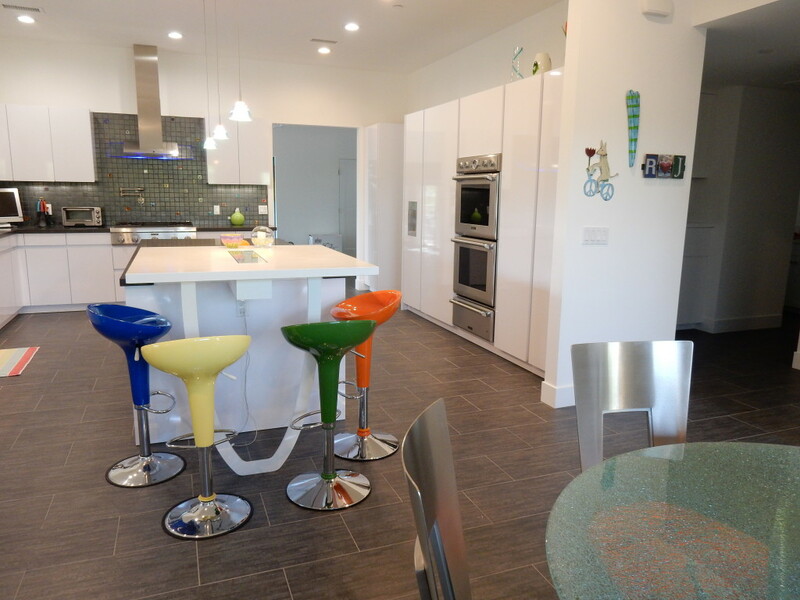 The counter stools from their old home worked nicely with this new design and offer another element of color in the space. 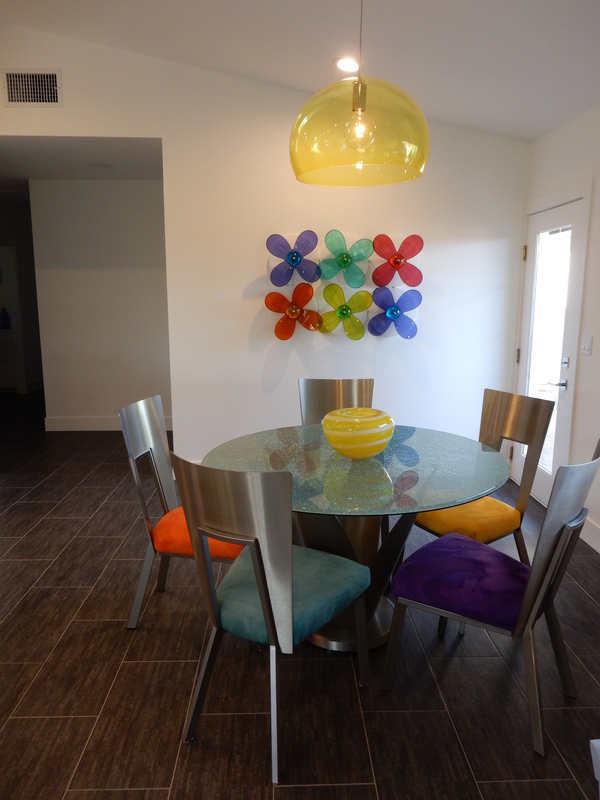 The breakfast area is full of fun color! Their old breakfast chair seats were recovered in new ultra suede in different hues and this amazing light overhead is from Kartell. 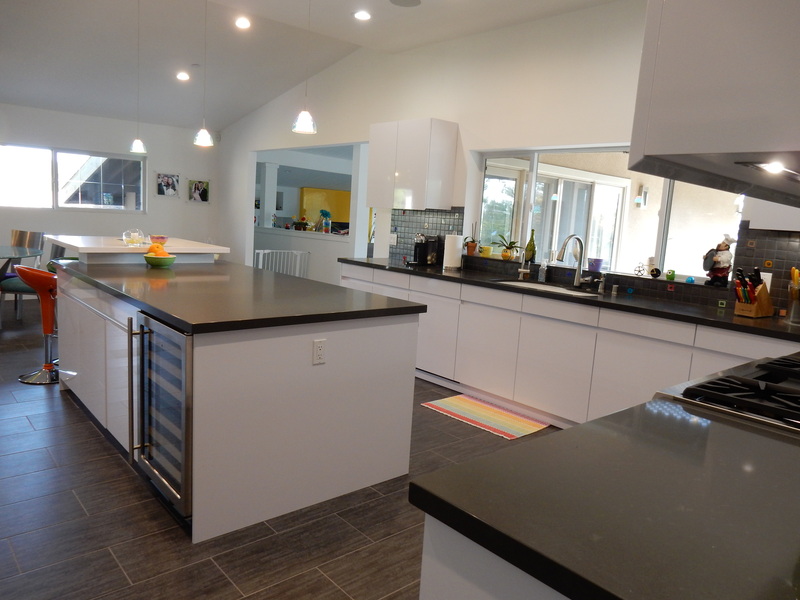 We still have a lot to show from this home tour. Up next will be the office that our dad built … stay tuned! We were so excited when Chairish (an online marketplace for vintage and used furniture) approached us about being part of their Mix n Match Style Challenge. The challenge is to “create a styleboard displaying a room of your choice, mix different styles of furniture to complete the look, then share the inspiration behind your design on your blog. We want to hear all about your advice and tips on mixing styles … the possibilities are endless!” As you can imagine we are always up for a challenge, and we don’t take these kinds of things lightly. So we gave it our best shot! We couldn’t agree with her sentiments more and have personally been using this style in a lot more of our designs lately. In fact, Lauren was recently speaking to one of her clients about this exact subject and the idea of mixing Mid-Century Modern pieces with other styles. 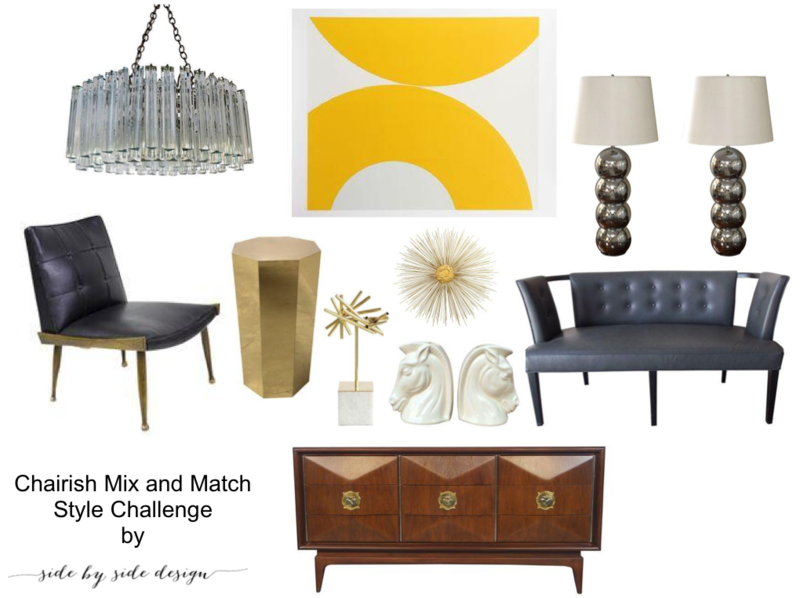 Since this is so fresh in our minds and Lauren is using this concept in that particular client’s entryway, we decided to come up with an inspiration board for another entry using all pieces found on the Chairish website. We found that it was not only so much fun but inspired us to broaden our horizons with design as well. We really had a great time putting together this look and participating in the Mix n Match Style Challenge! Thank you Chairish for giving us this opportunity. We can’t wait to see how other designers interpret this concept. Readers, what do you think? 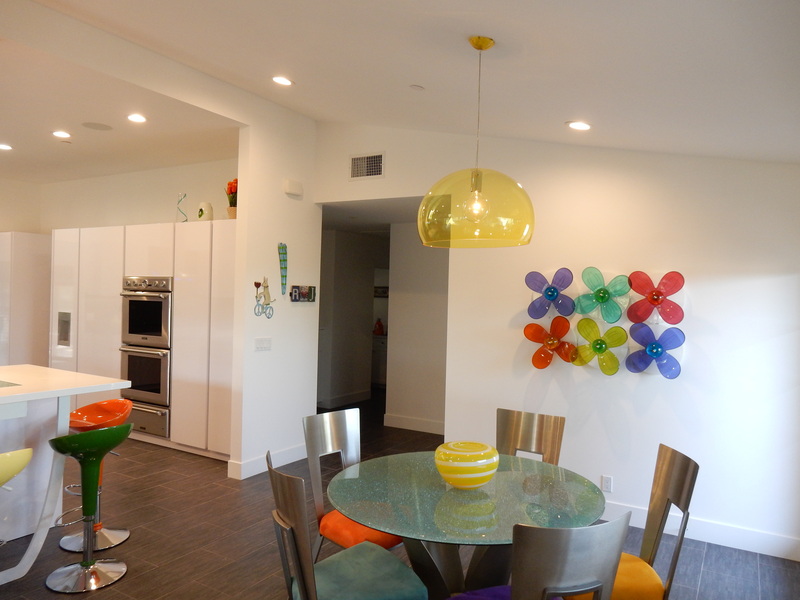 It seems, Mid-Century Modern is the way to go … are you interested in incorporating some of this design into your own home? Leave us a comment by clicking on the icon below. We always love to hear your thoughts. 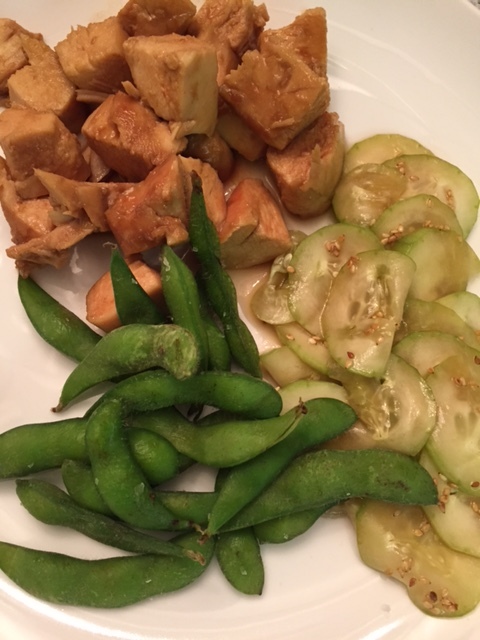 Japanese Cucumber Salad – Not just “something extra” but a really yummy treat to go with any Asian meal (recipe found here). 1. 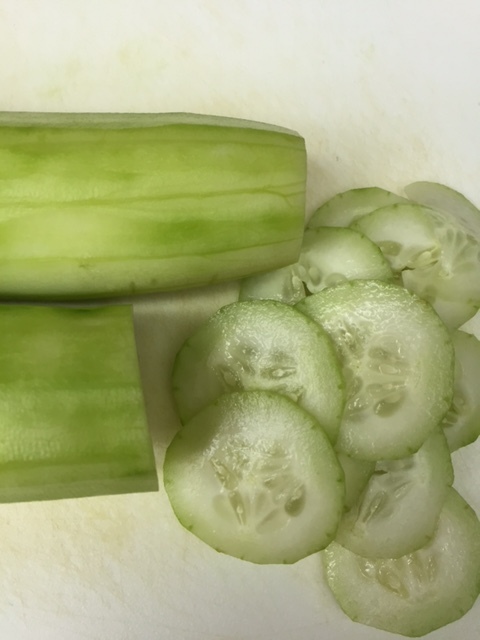 Cut 2 large cucumbers into very thin slices. 2. In a bowl, mix the cucumbers with 1/2 teaspoon of salt to draw out the excess water and let sit for 5 – 10 minutes. 3. 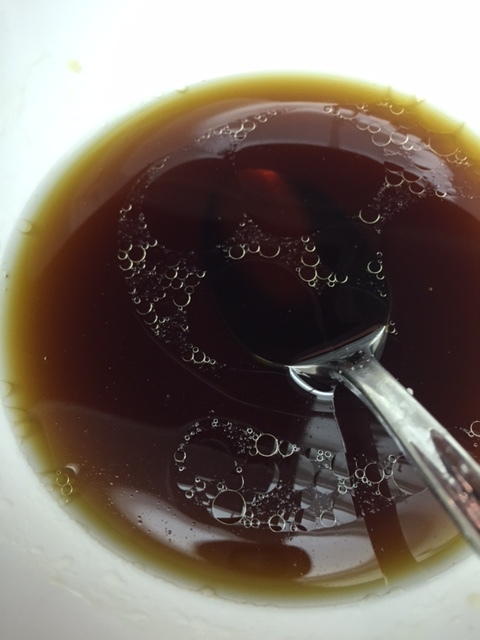 In a small bowl, mix together 1/2 cup white rice vinegar, 2 tablespoons soy sauce, 2 teaspoons sesame oil, and 2 tablespoons sugar until the sugar is completely dissolved. 4. Drain the cucumber slices in a colander and gently squeeze them with your hands to draw out any remaining water. Return them to the bowl and mix in the sauce. 5. 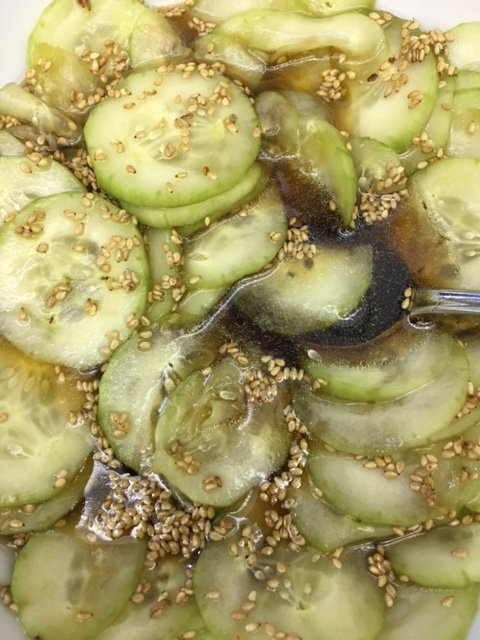 Add 1/2 teaspoon of sesame seeds and enjoy! Slow Cooker General Tsao’s Chicken – A unique chicken dish with a hint of sweet in the sauce (recipe found here). 1. 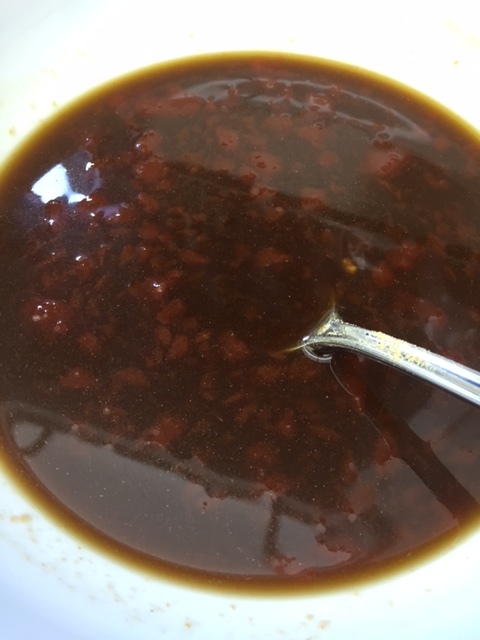 In a bowl, mix together 1/2 cup water, 3 tablespoons hoisen sauce, 2 tablespoons soy sauce, 1/2 cup brown sugar, 3 tablespoons ketchup, 1/4 teaspoon dry ginger, and 1/2 teaspoon crushed red pepper (optional). 2. 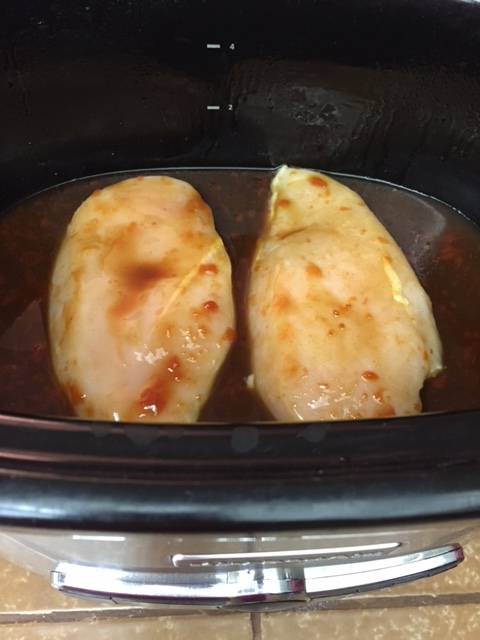 Spray crock pot with cooking spray and add 4 boneless skinless chicken breasts. Add sauce on top. 3. Cook 4 – 6 hours on low. 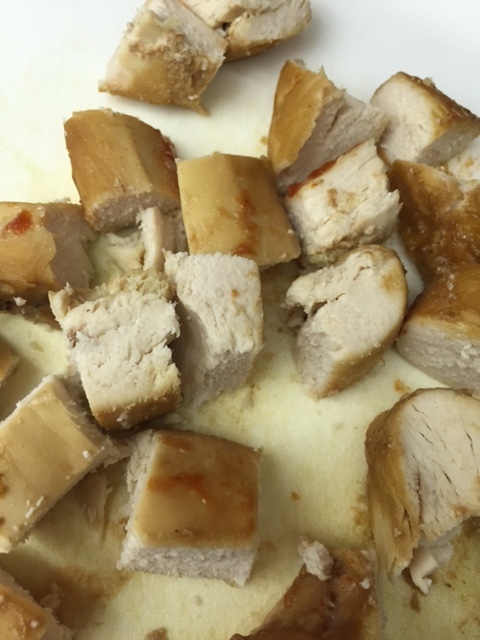 Remove chicken and cut into chunks. 4. Mix 1 tablespoon cornstarch into the sauce left in the crock pot for a thickening effect. We hope you have enjoyed this edition of our weekly Food Fridays post. Sharing these recipes helps us to constantly be looking for new things to make at home. We love Pinterest! Do you have a favorite recipe to share? We would love to hear from you. Click on the icon below to leave a comment. On Monday, we shared the first space (a powder bathroom) from this transitional yet edgy home. This featured project has been an opportunity for us to work with our dad as well as a client whose style couldn’t be more on point with our own. Lauren began working with this client towards the end of this phase of the project and was very pleased with the work that had previously been done. The kitchen was designed so closely to her own aesthetic that she wouldn’t hardly have changed a thing. She did, however, get to help with the finishing touches to complete this gorgeous space. 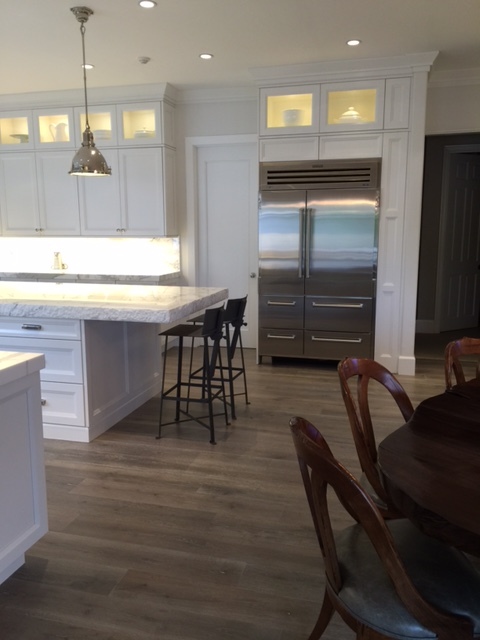 The cabinetry layout was designed by Anat Yifrah at Showcase Kitchen and Bath and built by Wood Mode Cabinetry. 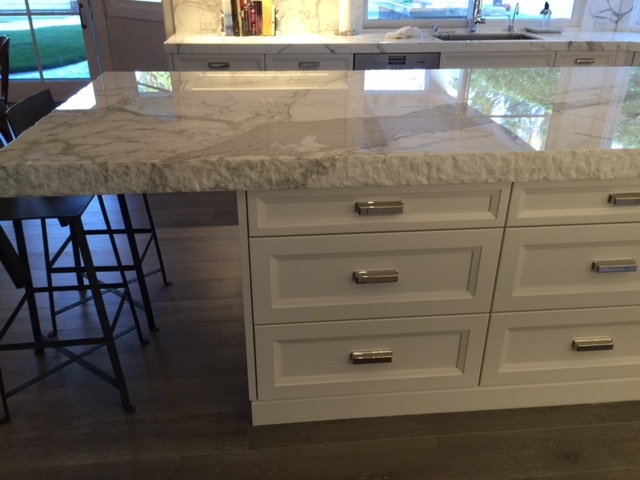 We especially love the Calcutta Gold marble counter tops and backsplash, and the chiseled edge detail on the island is simply gorgeous. 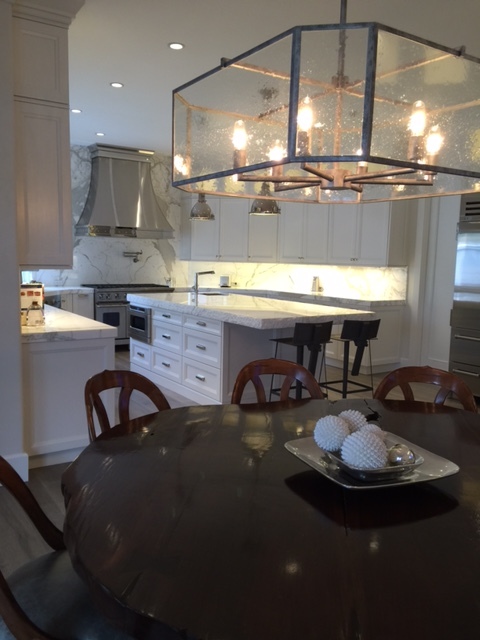 Lauren assisted her client in selecting these Ralph Lauren pendant lights for over the island as well as the industrial barstools and all of the cabinet hardware. 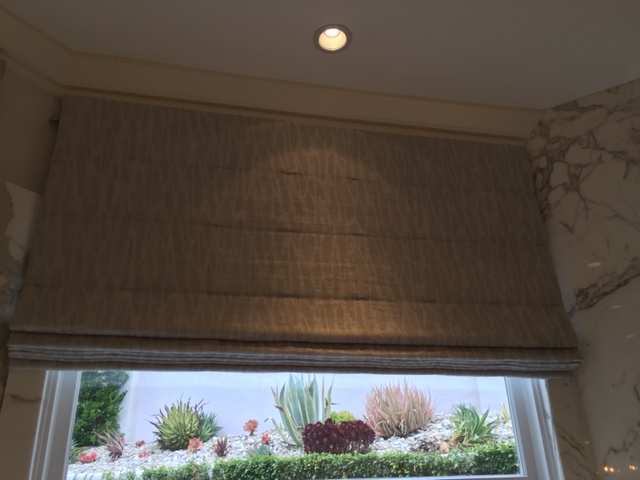 She chose this patterned sheer fabric for all of the window coverings in the space, and loves how they turned out. We love the existing rustic pieces as well, including this gorgeous live edge table and wooden chairs. They give this room a natural element which balances nicely with the overall crisp feeling of the room. 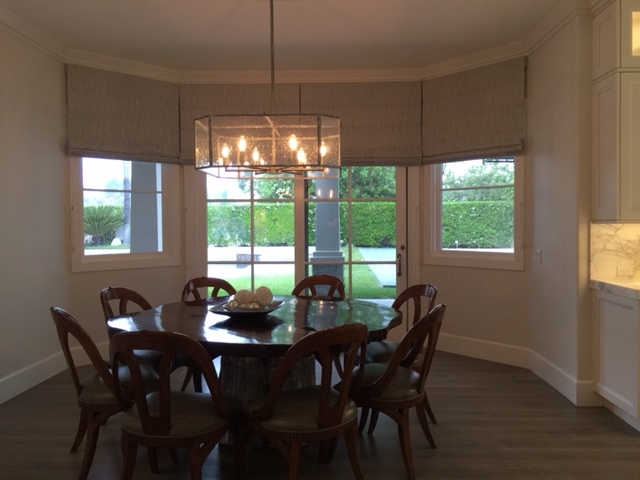 To finish off this beautiful breakfast nook, Lauren had matching Roman shades made in the same fabric as the kitchen shades, and our faux painter dressed up the table base with a little silver leaf. We are so happy with the result. 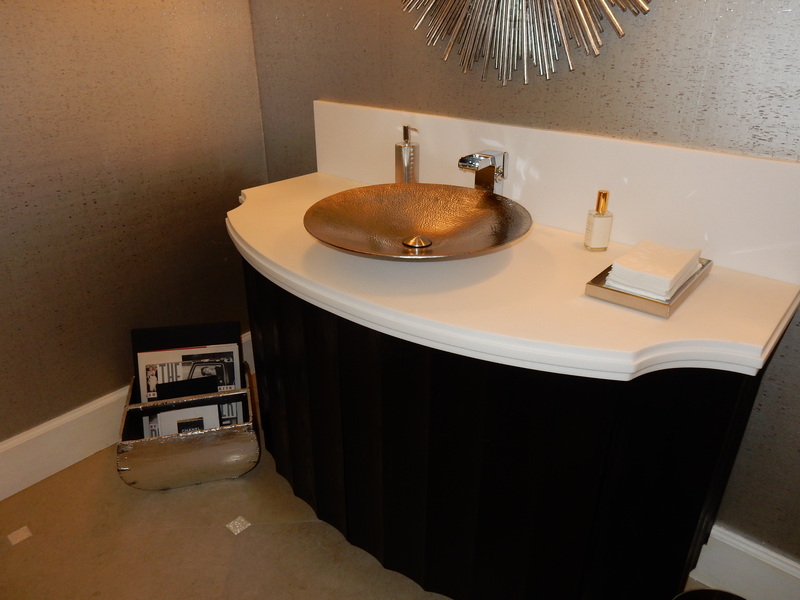 We will be continuing to showcase rooms from this featured project over the next few months … stay tuned! For some reason, the powder bathroom seems to be the starting point for many of our interior projects, and not by mistake either. 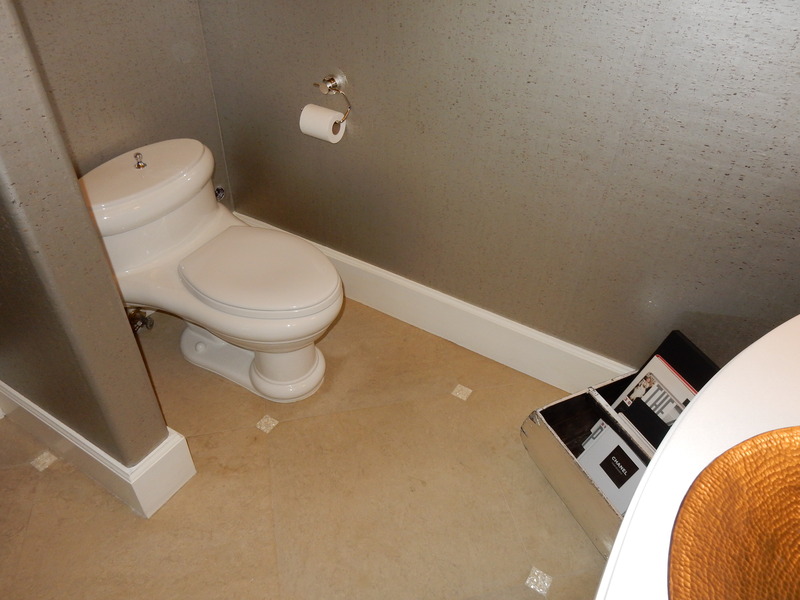 When you think about a powder bathroom, it is a small but important space. It is small enough to make a statement, easy enough to complete quickly in order to gain the trust of your new client, and is sure to be used by many visitors along the way. 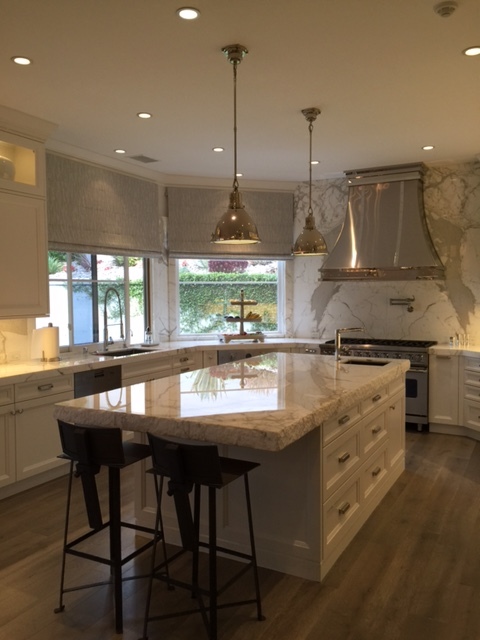 When done right, it can not only be a small jewel box within your home but a true show stopper. 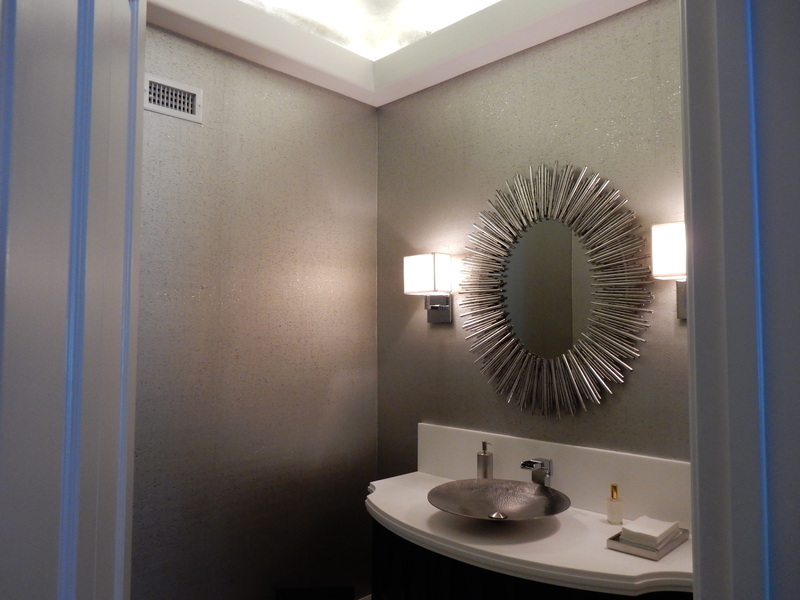 We went into this particular project with all of these ideals in mind and came out with a silver bathroom that ties in all of the elements of this particular client’s design aesthetic with class and grace. Finding the right balance within the design of this bathroom was the key to a great design; modern with an earthy effect, formal yet edgy, clean lined and classy. 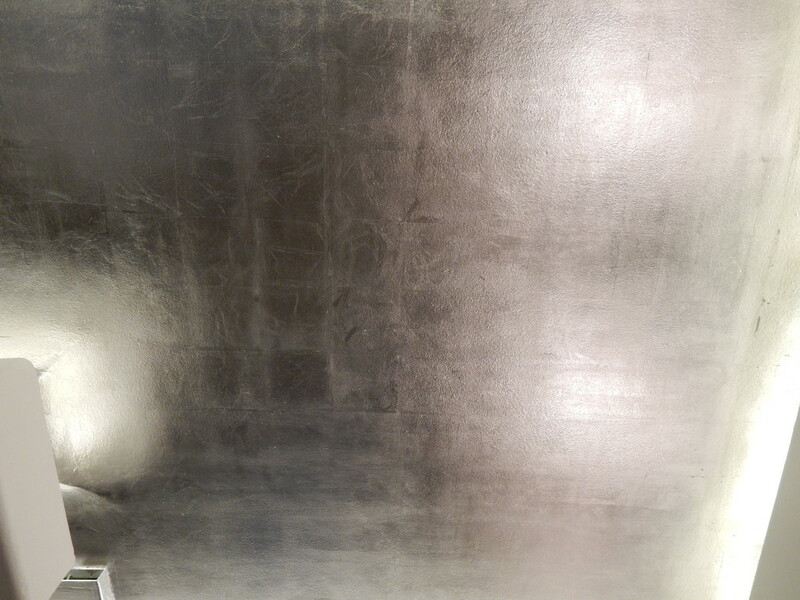 We decided to keep the majority of the room in the silver tone to give it that jewel box feel we were speaking of. 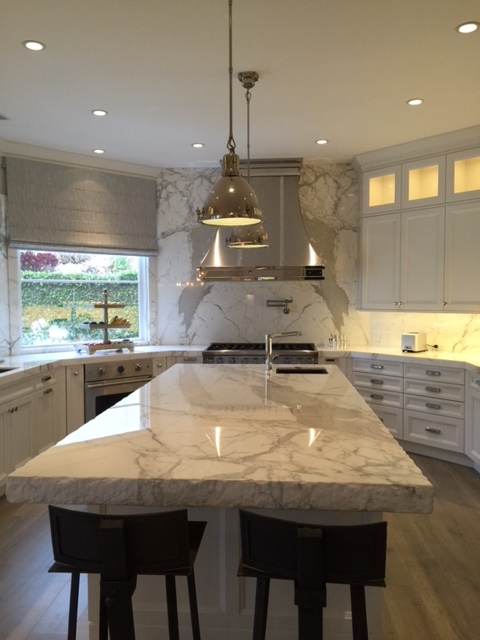 We left the existing cabinet alone but replaced the old counter top with a new white granite top. 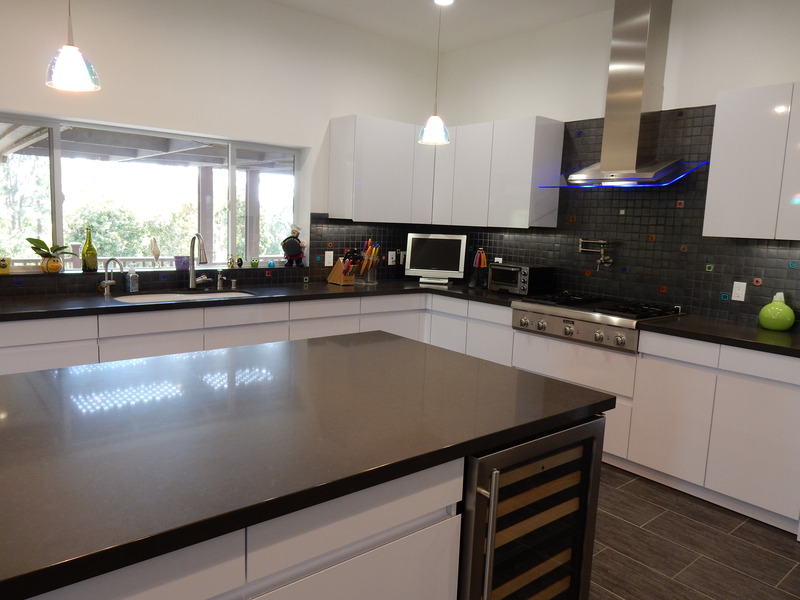 Its new squared off back splash and stacked edge detail gives it an edgy flair. 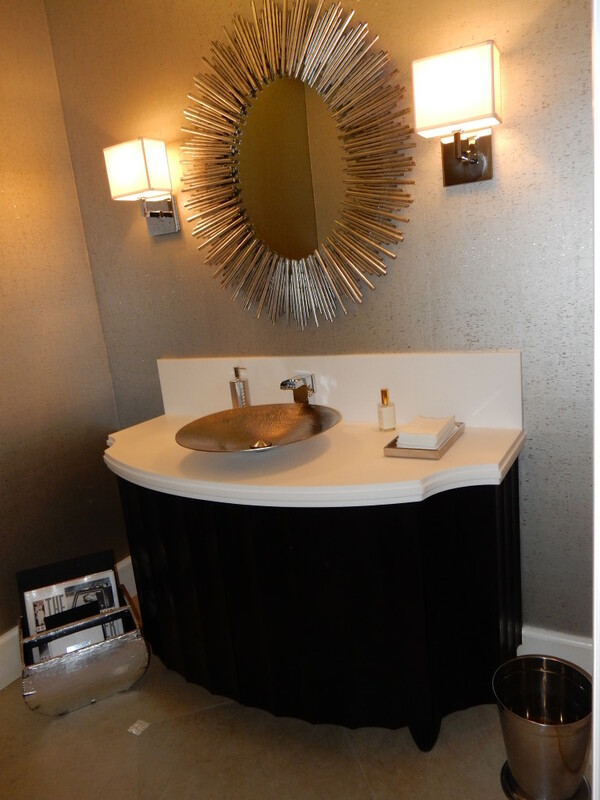 We also left the existing sconces alone but added in this cool new mirror which is more like a piece of art in this space. 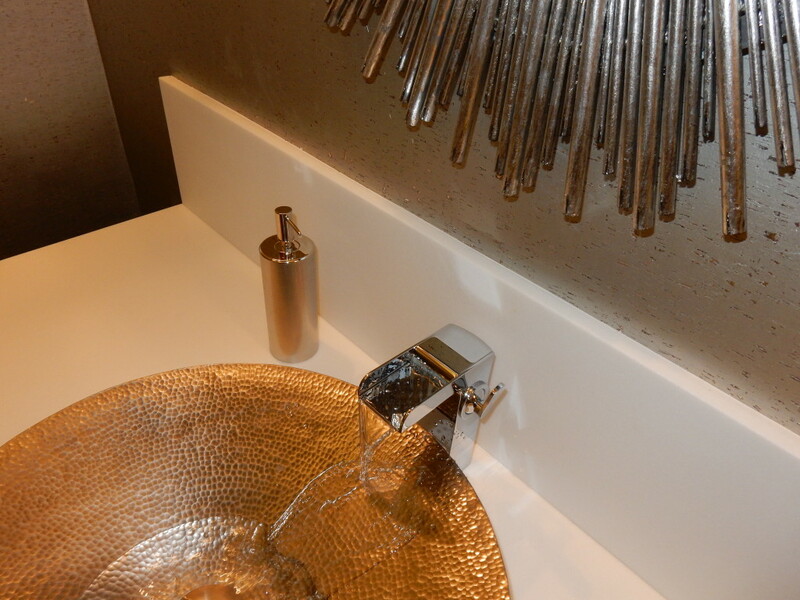 The new hammered metal vessel sink looks really cool with this modern widespread faucet by Artos. 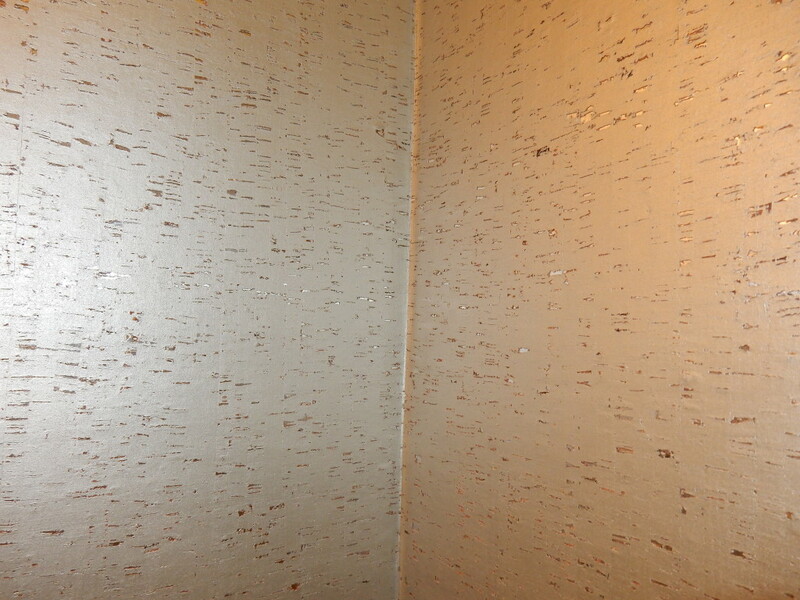 When Lauren took on this project a few things had already been started, such as the selection of this gorgeous silver cork wallpaper from Phillip Jeffries. We wanted to do something interesting to the ceiling as well. We opted to keep the soffit white and only finished the ceiling within. 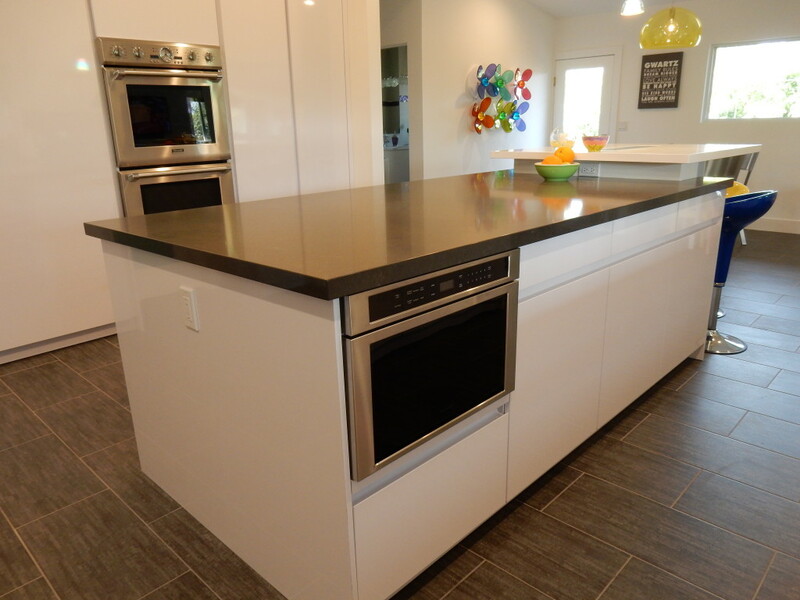 Lauren met with her faux finisher to come up with a plan and decided on a silver leaf finish to make this space really shine. 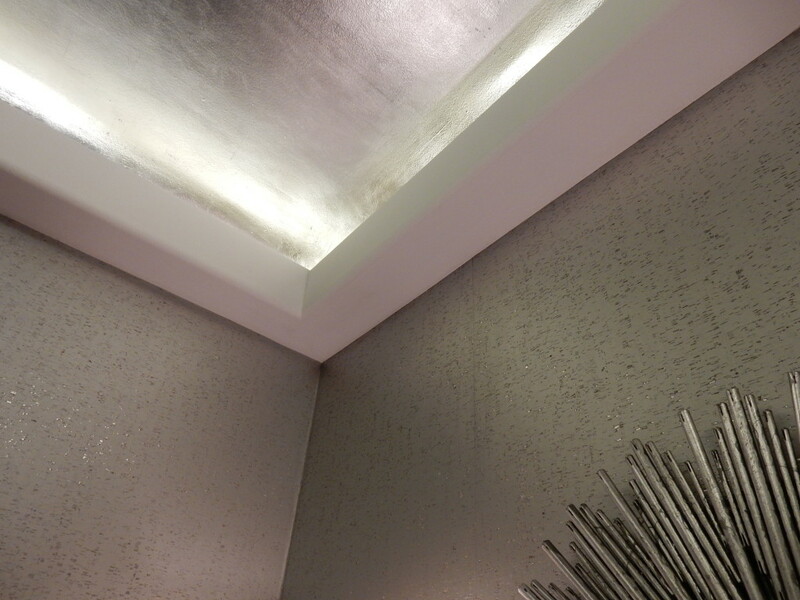 They then replaced all of the lights within the soffit to give it a proper white glow. Of course, a bathroom gets accessorized too. 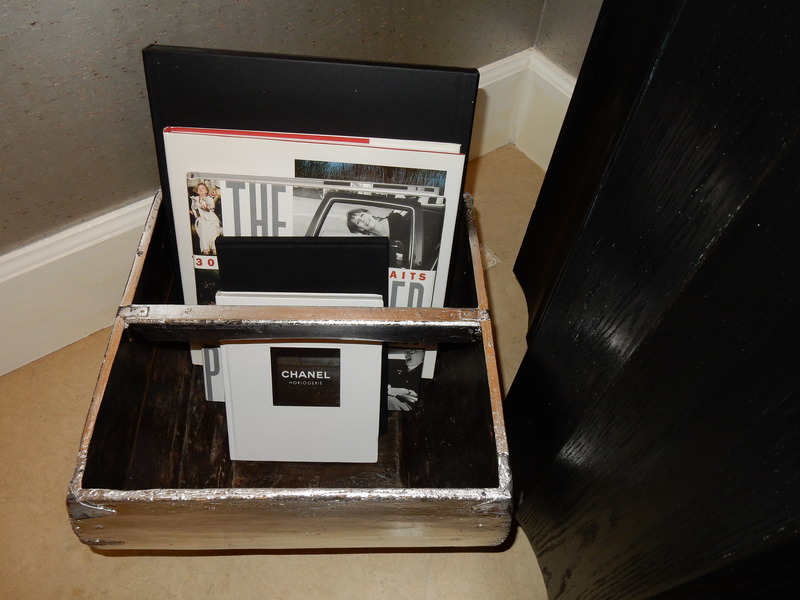 The client had this cool wooden basket which we had silver leafed to tie in with everything else and she incorporated some of her favorite black and white reading material to fill it up. This project has really been a great one for Lauren. Not only has she had the opportunity to work with our dad throughout the entire process, but the client is incredible and the style couldn’t be more on point with her own. This is just the first room we are showing from this featured home, and we can’t wait to show more as each space is completed.